The large white bird flew in gracefully into the fig tree, preened its wings a bit using its long downward-curved beak, squawked at its neighbours, and settled in for the night. This was the Black-headed Ibis — a globally near-threatened water bird, that had just settled into its night roost. That the ibis was roosting was not a big surprise — several water birds get together on a tree top each evening, and roost together until day break. It is thought that they take refuge in numbers. There are, however, exceedingly few studies on roosting, and none from Asia to help us understand the ecology of roosting. In a recent study, researchers from Mohanlal Sukhadia University in Rajasthan’s Udaipur collaborated with the Nature Conservation Foundation and the International Crane Foundation to parse out the nuances of roosting Black-headed Ibis. The study discovered that this species roosts in a variety of locations, including noisy, heavily-populated urban centres in southern Rajasthan. Birds in urban roosts faced many times more human disturbance than roosts in rural trees, but that did not deter them from roosting. Human attitudes towards animals are famously positive in Rajasthan, and researchers had recorded yet another example of this co-existence with roosting ibis. 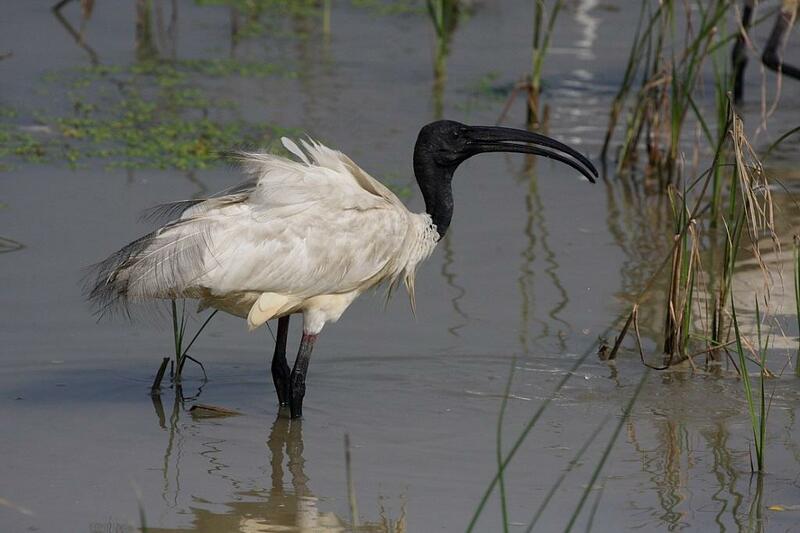 An equal number of ibis roost sites were discovered in rural and urban areas. Common understanding on water birds has always assumed that large water birds avoid urban areas, but this understanding was not accurate in southern Rajasthan. This was an exciting finding since it pointed to these birds having much greater dexterity in adjusting to human-modified conditions than was previously known. Species that show such adjustments have a much better chance of surviving the Anthropocene, where human modifications is more the rule than the exception. Black-headed Ibis roosted not just by themselves, but among other water birds such as storks, herons, and even parakeets and crows. The researchers carefully listed all the birds roosting with the ibis, and then searched for roosts nearby that did not have Black-headed Ibis. Astonishingly, the bird communities that roosted with the ibis were different from those that roosted on trees without ibis. The Black-headed Ibis appeared to be actively choosing who they roosted with. The list was not trivial in that it included other species of conservation concern such as the Painted Storks and the Black-necked Storks, in addition to the commoner egrets who frequent wetlands everywhere. It is not clear from this single study why they are choosing a particular set of species to roost with, but that is a question that begs answers and promises to be fascinating. The researchers then located nesting Black-headed Ibis, and compared nest sites with roost sites to understand if there were differences. Many nest sites were on trees that were surrounded by water apparently to help reduce predation, but trees on which the ibis roosted were just about anywhere. Roost locations included fields, beside roads, near wetlands, and in the middle of bustling cities. More interestingly, ibis numbers on roosts were many times more than the numbers of ibis in nesting locations. In terms of the total numbers, the roost sites were far more important relative to breeding sites. This was an unexpected and novel finding with clear conservation implications — roost sites need as much conservation effort as do breeding sites! The researchers then went on to measure several ecological parameters at both, roost and nesting sites — did Black-headed Ibis choose sites with similar characteristics for nesting and roosting? It turns out that they did not. Surprisingly, roost trees were much larger than nesting trees. Bird watchers and ornithologists have watched roosting water birds for many years now, and this study on Black-headed Ibis suggests that we ought to be taking a much closer look. With so many resident water birds in India, the study of roosting birds promises to be a field rich in discovery. Like these researchers did, it is very likely that other similar studies will uncover not only behaviourally interesting facets, but will find aspects that concern their conservation. For now, southern Rajasthan appears to be providing conditions for hundreds, if not thousands, of roosting and nesting Black-headed Ibis. The people appear tolerant of roosting water birds despite the noisy and smelly conditions that so many birds end up creating. This is not a trivial toleration, and is completely different from people in some economically-developed countries that demand removal of trees and birds when water birds aggregate close to their homes. Black-headed Ibis do face the challenge of finding large trees year after year to roost on. This challenge is increasing as such trees are cut down to make room for wider roads, for more apartment complexes, and shopping malls. However, development is not being carried out at the same pace, or even with the same characteristics everywhere across India. It is our fond hope that these birds will continue to roost amid people in cities and farmers in rural areas for a long time to come. This study will be published in the March 2019 issue of the international journal “Waterbirds” as “Roosting ecology of the Black-headed Ibis (Threskionis melanocephalus)in urban and rural areas of southern Rajasthan, India”. Authors are Vijay K Koli (assistant professor at Mohanlal Sukhadia University), Sunil Chaudhary (PhD Scholar) and K S Gopi Sundar (the Co-chair of the IUCN Stork, Ibis and Spoonbill Specialist Group).